Celebrate with me as I finally return* to the most convenient event I’ve ever tabled at — the Winchester Pickle Festival, right here in Winchester, NH this Saturday, September 27 from 10:00 AM to 4:00 PM! The event kicks off at 10:00 am with a parade! […] Nelson town band, Winchester town band, northern ridge rythm band, weathered roads country band, junction 1-3-5 quartet, mavericks line dancers. Free pickles, homemade pickle judging, pickle eating contests! 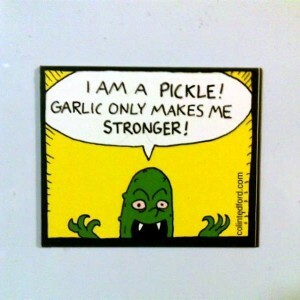 Mr. Pickle actually exists! He doesn’t look like that drawing above, though; he is our State Representative Henry Parkhurst in an eye-popping green suit and bowler. A Vampire Pickle could be hanging on your fridge! I turned one of the most dramatic panels from “Midnight Snack” into a magnet you can buy! 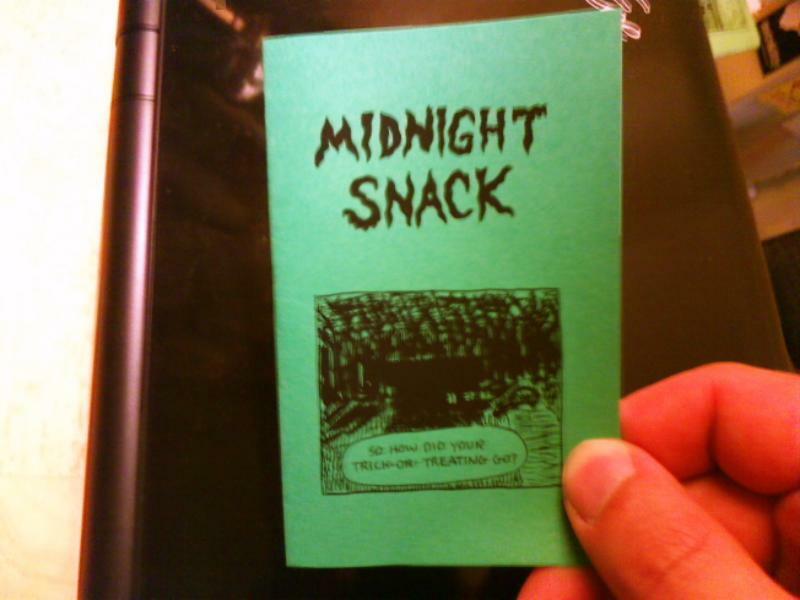 Get copies of “Midnight Snack” formatted as a minicomic to give to trick-or-treaters, Halloween party-goers, goblins, etc.! Buy packs of “Midnight Snack” & my other Halloween comics. Right-click & download the PDF of “Midnight Snack” to print. All I ask if you download is that you email or leave a comment to let me know you downloaded it and how many you plan to print & where (for example, “30 copies for trick-or-treaters in Putney, VT”). Over at Trees & Hills, Daniel Barlow describes our excellent trip to the Boston Zine Fair (and includes photos! ), and I report on the Winchester Pickle Festival (with a sketch because I don’t use a camera). I’ll post about my trip to the Philly Zine Fest soon, and post more Doodles (I’m behind in my scanning). Wow, I’ve been busy. This past weekend’s Boston Zine Fair was excellent. 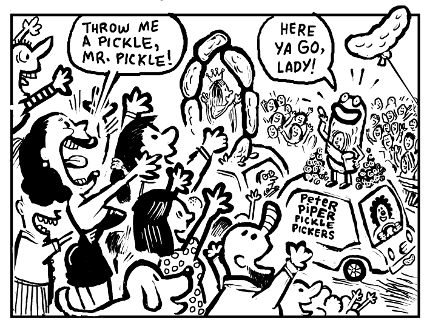 This coming Saturday 9/27, I’ll be tabling for Trees & Hills at the Winchester Pickle Festival, and maybe doing pickle-themed caricatures or something. Sunday 10/5 I’ll be tabling at the Philly Zine Fest in a place called the Rotunda.